On April 29th of 2015, I became a member of the Left Caucus of the Democratic Socialists of America. The caucus had been established to push for a fairly specific program within DSA, many of which points were adopted at the organization’s Biennial National Convention this Summer (including withdrawal from the Socialist International and formal endorsement of the Boycott, Divestment and Sanctions movement). 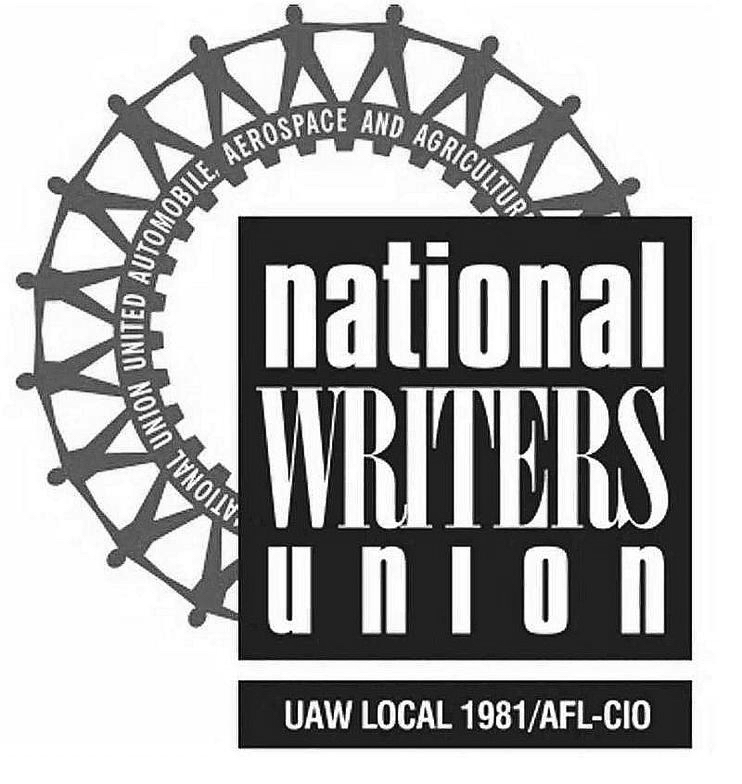 Although the group was ultimately largely successful in accomplishing the goals it had established when first formed during the Summer of 2014, it was becoming clear for some months leading up to the convention that commitment of many long time members to the caucus beyond the accomplishment of those goals was beginning to fade. I was delighted earlier this month to learn of a new group forming that proposes to be “The Radical Left Caucus of DSA” and after reading their points of unity and political program, I agreed wholeheartedly to an invitation to join the ranks. The public announcement of the Refoundation Caucus was made today. You can learn more on the website. We are a caucus of revolutionary Marxists active in Democratic Socialists of America. We wish to see DSA grow, flourish, and become a mass, independent socialist party in the United States. The times demand it. With the massive growth of DSA over the past year and a half, we believe we have a unique opportunity to build a movement and a party that can fight for and win socialism in the United States. We cannot let this opportunity pass. I would invite all to review the points of unity and political program of the group, and to keep an eye on the site for position papers and statements to come. To my DSA sisters and brothers who are interested in being part of a vital and vigorous self-conscious left wing, I urge you to consider joining us. As to the comrades who have been working so hard to organize and develop this caucus, I thank you. On the second episode of the Religion and Socialism Podcast, Reverend Jean Darling interviews Laura Barrett, Executive Director of Interfaith Worker Justice Network. 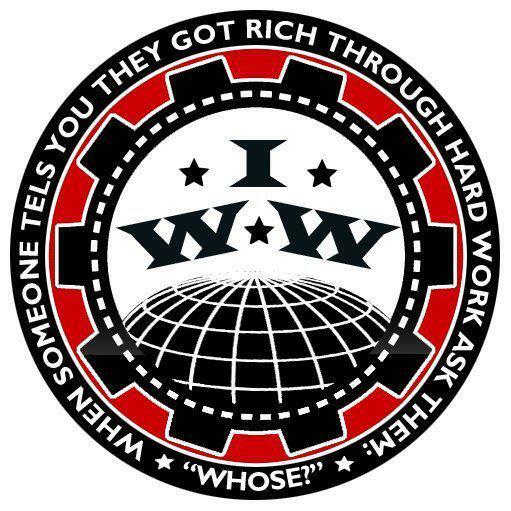 Thanks to Bob Roman and Tom Broderick of Chicago DSA for recording the interview. 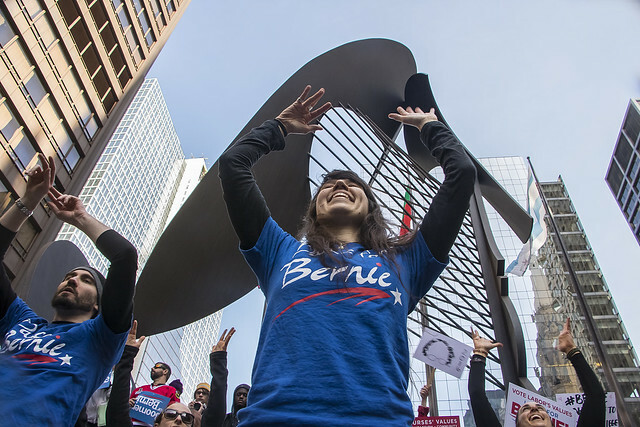 If you’re one of the millions who have been invigorated by the Bernie Sanders campaign and want to join the ongoing political revolution, this May 7th forum on movement building beyond the election is for you. 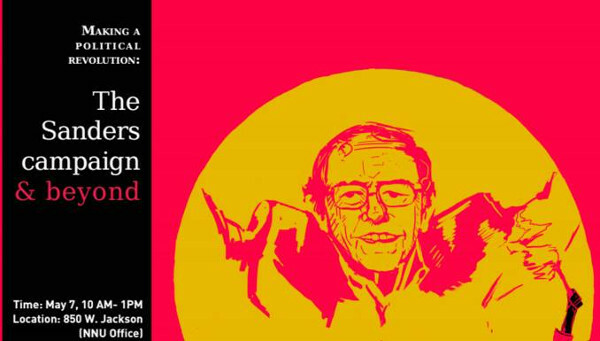 We’ll discuss the significance of the Sanders campaign, the meaning of democratic socialism, and strategies for confronting exploitation and inequality at the state and national level. We’ll also offer skills training on coalition building and grassroots organizing. Together, we’ll plan ways to channel the renewed interest in democratic socialism toward a sustainable movement for political transformation. There’s never been a more exciting or vital time to work for change. The forum is co-sponsored by the Alliance for Community Services, Chicago Democratic Socialists of America, National Nurses United, and Progressive Democrats of America. There’s more information on this Facebook event page. 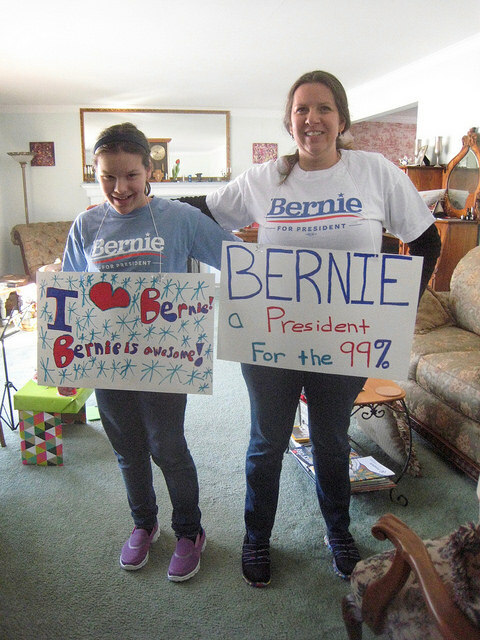 Our family was proud to be a part of the March for Bernie on Saturday, February 27th. 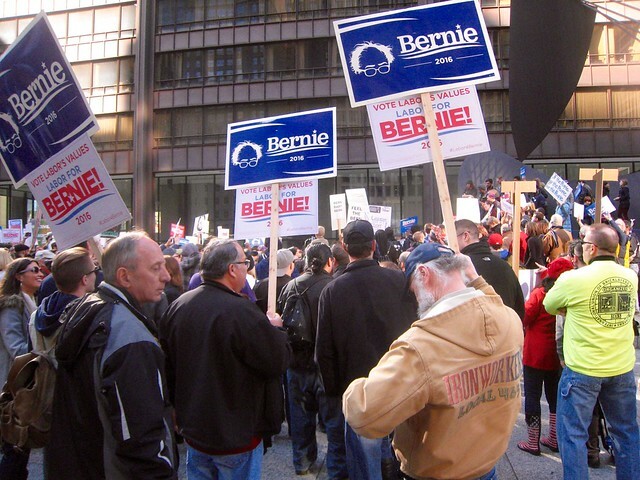 It was a beautiful day in Chicago, and great to be among comrades. 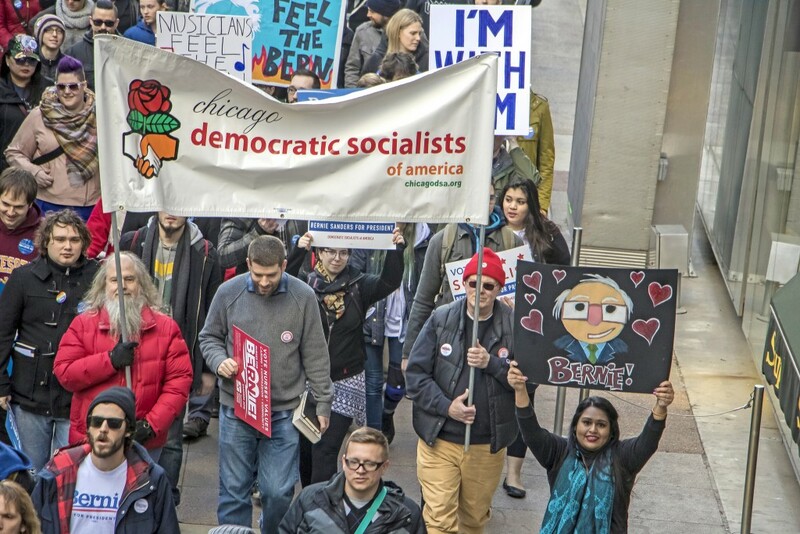 I offered to hold the banner for the Chicago DSA, not realizing that I was volunteering to help carry it along the route as well. My pal Bob Simpson has a photo album up on Flickr that captures the spirit of the day. I put a few shots of family and friends in a Flickr album too. The set is in reverse chronological order, starting with our ride home on the Metra. Also, there’s this short video from the march. This was our daughter Caroline’s first experience with a political event. She had a lovely time. 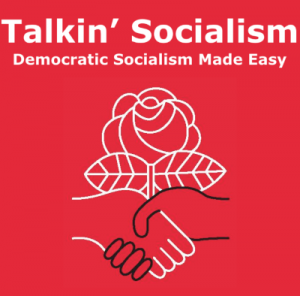 The Chicago DSA’s Talkin’ Socialism podcast was one of the first that I found when I was looking for an education in the matter. 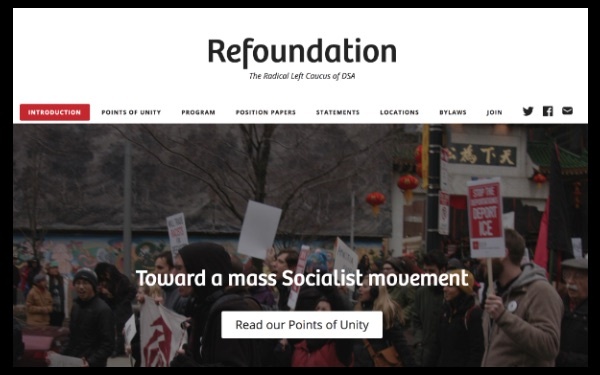 These are recorded each month in conjunction with the regular meeting of the chapter, and have covered a wide range of topics from socialist history and theory to current events here in Illinois. Recently, the program has undergone something of a reboot. Producer Robert Roman has moved the show site to WordPress.com, and the feed has been resubmitted to the iTunes directory. Highly recommended. Here are some links.